Reiss Beckford was one of the unlucky ones. A gymnast since he was six years old, he grew up dreaming of the Olympics. Like his illustrious team-mate and friend at the South Essex Gymnastics Club, Max Whitlock, he devoted his teenage years to the ambition of competing at London 2012: spending countless hours in the gym, working the rings until his palms were callused and pounding the parallel bars until his biceps were black with bruises. But Beckford's dream didn't come true. London 2012 arrived and while Whitlock was in, he was out: named as the team's reserve, or 'number seven', just as he had been for several major championships before. He had to watch from the stands as the world's greatest sporting festival rolled into town, had to see his team-mates acclaimed as heroes - winning four medals, Great Britain's best ever total - while his own once-in-a-lifetime opportunity disappeared in a puff of chalk dust. "It was OK," says the 23-year-old Beckford philosophically. "It comes with the sport. "I was sitting there in the arena cheering them on every day, watching them as they were not just team-mates but friends and I was so proud of them and happy to see them do so well. "But it sparked a bit of motivation." That motivation burns brightly as Beckford prepares to compete at the 2015 World Championships this week. But instead of competing alongside Whitlock in a British vest, he will be competing against his childhood friend - for Jamaica. Beckford's improbable story began with a chance encounter last year. "I was approached by a woman named Marlene who is the team manager for Jamaican gymnastics and she asked if I'd like to compete for Jamaica," he explains. Beckford's grandparents on his father's side were both Jamaicans who emigrated to the UK in the 1950s. At the time she approached him, his career was at a crossroads. After enjoying instant success as an 18-year-old at the 2010 Commonwealth Games, where he won three silver medals, Beckford was finding it increasingly hard to break into a strong Great Britain team including the likes of Whitlock and Louis Smith. Having stood on the podium, he was tired of sitting on the sidelines. "At first I didn't think much of [the offer]," he says. "When I was younger my granddad always joked about competing for Jamaica but at the time it wasn't possible. "But I then found out they had created a gymnastics federation. I saw the opportunity of competing for Jamaica and reaching the Rio Olympics so I took the jump." It would be an unlikely story. Jamaica, the Caribbean island best known for its all-conquering sprinters, has sent bobsledders and badminton players to the Olympics, but never a gymnast. "Track and field is really big in Jamaica but it would be cool to show the kids that there are other sports out there as well you can do," says Beckford. However, reaching Rio will be far from straightforward. 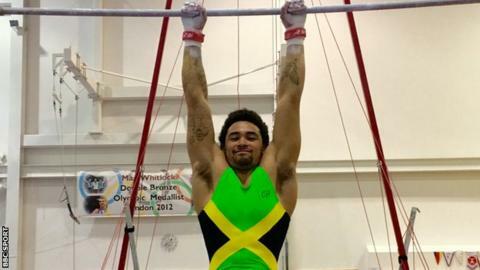 There is no Jamaican men's team at the Worlds and he is not likely to win an individual apparatus event - meaning he will need to rely on the test event, continental qualifier or perhaps even an invitational place to make the Games. And to make his Olympic dream a reality, Beckford has also had to give up all the financial support he qualified for as a British gymnast. "When I changed from competing for Great Britain to Jamaica I lost benefits such as funding, travelling, hotel costs and competition entries," he explains of the switch he made in January this year. "It's much more of a graft now. When you're with a country like Great Britain all you have to focus on is your gymnastics. Now there are all these small things that you never realised you had to do like organising your own hotels and own flights." The life of an unfunded athlete is a struggle, and the entrepreneurial Beckford has turned to online crowdfunding to support his efforts to become Jamaica's first Olympic gymnast. "Initially I have tried to raise around £5,000," he says. "That will help towards costs and hotel and transport for the upcoming competitions." Beckford will compete on all six pieces of apparatus in Glasgow - vault, floor, pommel horse, rings, parallel bars and high bar. And the 23-year-old, who will also take part in the individual all-around, which rewards the best gymnast across all six pieces of apparatus, is finally ready for another shot at the big time. "It's an amazing feeling and I can't wait to be there," he says. "I don't really know how it's going to feel yet but I'm really excited and hopefully I can put in a good performance." And after the disappointment of London 2012, Beckford believes that the journey that began with the help of his family's roots can end at the summit of his ambition: a place at the Olympics in Rio. "It would be amazing," he says. "I have had the dream of competing at an Olympic Games since I was six years old. I guess Usain Bolt would be the flag-bearer for Jamaica and to be able to walk in behind him at the opening ceremony would be incredible. "I want to show people my skills and routines and show that I am a good gymnast and not a number seven." But when Beckford chalks his hands and steps out onto the floor, he will not just be trying to fulfil his own dreams, but also to inspire a country and honour his heritage. "My grandparents aren't here any more," he says. "But if they were, I think they would be really proud."